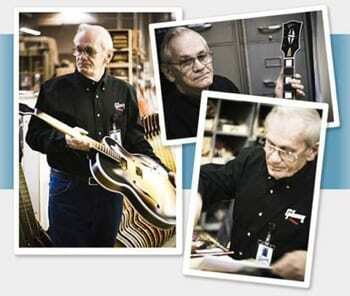 One of Gibson Guitar’s most accomplished and dedicated luthiers, James “Hutch” Hutchins, passed away last night, Jan. 25. He was 72 and had been battling an undisclosed illness. Hutch’s career with the company spanned 45 years, two states, three changes of ownership, and thousands of guitars. He joined Gibson on March 25, 1963 in the original Kalamazoo, Michigan plant, making a name for himself there before transferring to Nashville in 1983. The company says he worked every job from maintenance to pattern making with an unflinching attention to detail and an abiding pride in the Gibson name. Gibson says he helped define its legacy, heritage and tradition through the many guitars and people he worked with. 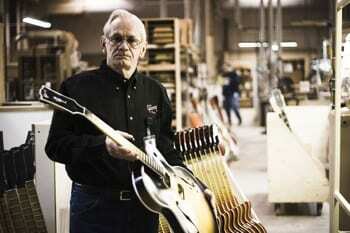 Hutch became the plant’s liaison for legendary artists who wanted custom guitars. He was integral to designing the Chet Atkins Country Gentleman, and became friends with Atkins in the process. Hutch retired March 31, 2008. Hutch loved to hunt and fish and spend time with his three grown sons, all of whom live in the Nashville area. He is survived by his wife his sons and wife Gail.